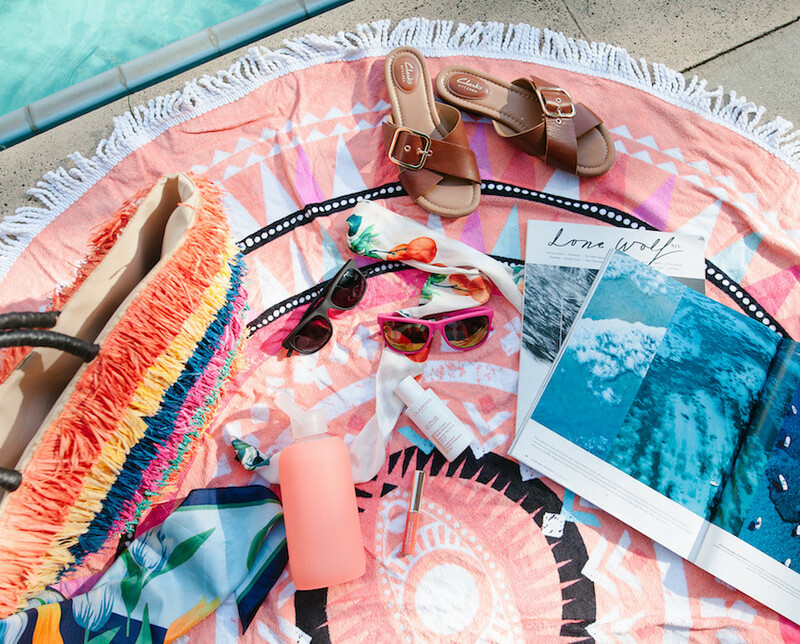 Let’s talk about the best of summer necessities, because you want to spend less time worrying about the accessories you need and more time enjoying your fun in the sun. I’ve been traveling about once a month for the last two years and I started out miserably lugging around heavy, overpacked bags from the plane to beachside or miles through cobblestone streets. Now, I’m an experienced, efficient packer without sacrificing the necessities that keep me going from day to night on a getaway. In the summer months, my curated focus relies on sun protection. Even when I’m not traveling, I keep these items in my bag daily, because I believe sun protection is such an important element to beauty and health. The necessities that fit into my everyday tote include a SPF50 sunscreen, a moisturizing lip balm with SPF, a roll-up hat visor, my chic BKR water bottle for staying hydrated, and lastly but not least, my new Polaroid Twist sunglasses. The Polaroid Twist Collection offers sunglasses that are super lightweight, bendable, and virtually unbreakable, so I love them because they’re not only cute and stylish, but they’re also the best kind of sunglasses to throw in your bag! Each pair offers true clarity, anti-glare vision, and 100% UV protection through polarized lenses, which isn’t as common as you think in most sunglasses and those qualities are so important in protecting your eyes from sun damage. They’re at such an affordable price, so I have Polaroid Twist sunglasses in two colors, black and pink, to match any type of getaway. Check out the new Polaroid Twist collection at Dillards.com! Such a cute bag and hat! There's something about that style that I covet so much at the summer, they are just the epitome of warm weather aren't they?! Your pics are so cute and colorful! What a fun summertime vibe. And that round towel is beyond adorable. Beautiful pictures and your dress is so pretty! Amazing! I love how your dress and sunnies match together. Lovely outfit. Those danglers looks amazing. Loved those long & stylish danglers. The photos look amazing! I loved the pink dress and glasses combination..